Wythenshawe Community Housing Group’s Real Food Wythenshawe project was delighted to win the ‘Best Pocket Garden’ award at this year’s Manchester Flower Show in June. 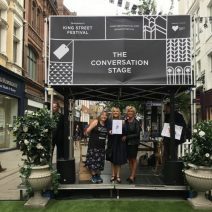 The show took place over the 2nd & 3rd of June as part of the King Street Festival in Manchester city centre, the Real Food pop up garden was focused and built around ‘edible’ flowers and proved very popular with attendees. Over the last few years the team have been involved with many of the different flower shows in and around Greater Manchester; winning gold at the prestigious Tatton Flower show and at Dig The City, also helping to create an Allotment of the Future in St Anne’s square as part of the Manchester Science Festival.